Many Mills experience liner and liner bolt failure. These failures are costly and can affect the viability of some operations. Boltstress Ultrasonics has eliminated these at several mine sites and mills. Liner bolts fail (break or loosen off) for a number of reasons but the vast majority of these can be eliminated if the pre-load is correct. Bolt failure fatigue is the most common mode; this is almost invariably due to pre-load that is too low. This can, in turn, be divided into 3 groups: inadequate original tension, consistency, and high relaxation. The interfaces between the bolt, liner & shell are rarely in a smooth or machined condition, consequently, the friction is greater than standard calculations consider. This results in low average bolt tension and will soon result in a bolt failure. The consistency of bolt tension is a bigger factor than most realize. 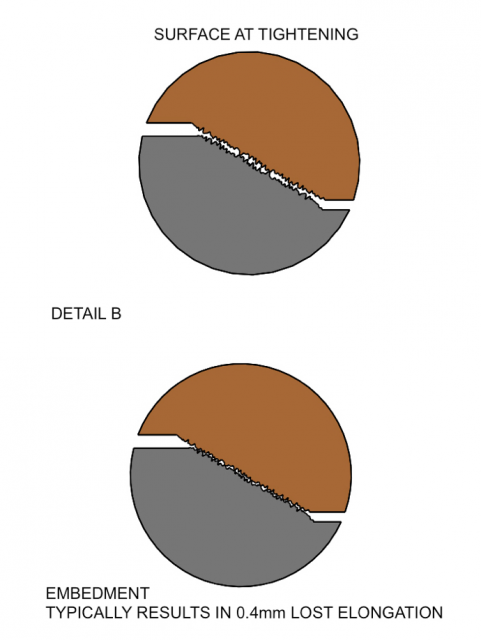 The relationship between torque tightening and bolt tension in good conditions is generally regarded as +/- 25%. Add in rough surfaces, interaction and short clamp length to diameter ratios and this becomes significantly worse. Our experience demonstrates that the variation becomes more like +25% – 100%; it is rare when we measure all bolts that we don't find at least one that is completely loose. The relaxation on liners is particularly high, the mating surfaces between the lifters, liner bolts and liner plates are roughcast and tapered. Any small embedment of high spots will be multiplied by the slope angle. By way of an example, if 0.1mm embedment occurs on a 1:4 taper that will result in 0.4mm in lost elongation. That is a likely scenario when both sides of the slope are considered. Restricted contact between metal in most thread fasteners. It is quite concerning that the contact existing between one metal to another is only about 20 percent. On the other hand, the remaining 80 percent is only air. This is detrimental to the thread tips due to extreme loads placed on them. As or well-machined and more expensive fasteners, the metal to metal contact that occurs is only up to 50 percent. Premature failure is the outcome of a poorly designed fastener, faulty selection of a fastener, and heavy loads and significant impact. Vibration is another culprit to fasteners becoming looser over time. With micromovements that result in vibration, this certainly does not do any good to the fasteners. When this arises, the fastener will easily unravel due to the friction existing from the spring washers. It begins with an air gap in the threaded fastener. When left unaddressed, this can result in corrosion. Afterward, a seizure can occur, progressing to greater issues such as disassembly of the fasteners. In this case, it is beneficial to make use of anaerobic threadlockers that stop corrosion, as well as eliminate loosening of the fasteners. Sealants can also prevent mud, sand, and other debris from getting into and wreaking havoc to the threads. Bolt failure is indeed a cause of alarm in the milling and mining industry because of the inconveniences and unnecessary expenses it brings. 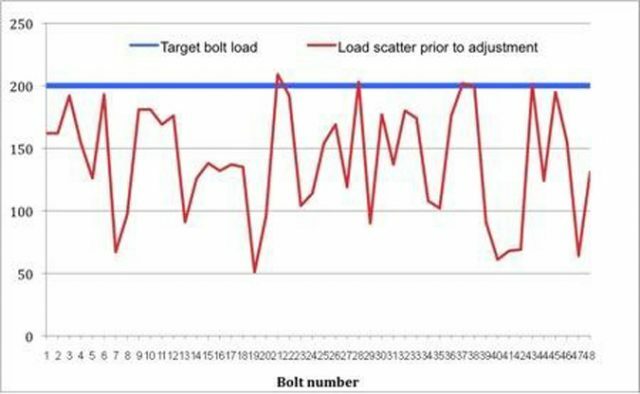 To solve and eliminate the effects of these common problems, we use Ultrasonic bolt tension measurements to prove the achieved pre-load and then adjust the torque settings to a qualified and considered level. This allows us to reduce shutdown durations, eliminate failures thereby avoiding unplanned downtime. Calculate allowable tension for the bolts. Determine allowable stresses for mating parts. Set up ultrasonic data files. Allow re-line crew to tighten 1st set/row of bolts. Calculate average tension, review and adjust tooling pressure settings. The results below show the normal variation that torque tightening generates. The average is well below the required pre-load. The variation is + 5% / -75%, which is consistent with other work we have completed. The graph below shows the final result after adjustment of each bolt. The outcome was the total elimination of all bolt failures. Prior to this adjustment, the bolt failure rate was one per week, each time causing an unplanned breakdown. Ultrasonic Bolt measurement and adjustments are just one of the many services we offer to mill operators to prevent bolt failure unplanned breakdowns and costly repairs. If you're interested in learning more about our bolt ultrasonics experience and how our torque services can help to improve your profitability, reduce re-line durations and eliminate unplanned shutdowns, contact us today. One of our consultants will be able to help you with one of our unparalleled solutions.